Temple Beth Tikvah will be offering a special 4-week Torah study in August with a fresh approach. If you’ve been meaning to get to the weekly Torah study, but hadn’t gotten started yet, this is the perfect time to begin. 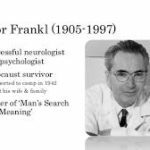 Study sessions will begin on Friday, August 10th, with a focus on text from Victor Frankl’s – Man’s Search for Meaning. Rabbi Johanna Hershenson will be leading the weekly Friday sessions from 10:00 to 11:30 am at the home of Evie Lerner. For this class, we would like RSVPs from those who are planning to attend so that Rabbi Johanna can prepare and send a week-by-week PDF of the study material. While study materials will be provided, if interested, you can get a used version of his book at a very reasonable cost. • Please plan for a 4-week commitment. While we understand that not everyone can attend every session, we would like a regular “core” group of participants. For RSVP and/or host questions, contact Evie at evielerner60@gmail.com. For questions about the study, contact Rabbi Johanna at johannahershenson@gmail.com. Check the calendar for the current schedule. Click here for this week’s parashat.